52 weeks, 52 new foods. How one family achieved the most frequently broken New Year's resolution: to eat healthy. Mom. Author. Healthy eating advocate. My kids were masters of the three Ps: pasta, pizza and peas. Mealtime battles were fierce. Getting my picky eaters to try anything other than a limited number of vegetables felt absolutely futile. That all changed when I turned mealtime into a healthy eating game. Kale is cool when it's worth 15 points and the race for bonus points had my kids begging for new foods to try. Brussels sprouts, beans and broccoli started showing up regularly at our family dinners. We were finally on the right path. When it came time for New Year's resolutions last January, as a way to earn more of those alluring bonus points, we decided to take on one simple challenge, together as a family: 52 weeks, 52 new foods. Unusual new foods like romanesco broccoli and quinoa stuffing joined us for dinner, along with familiar favorites prepared in a new way. But it wasn't because I was dictating the menu with an iron fist. 52 New Foods worked because it was easy and fun. Each week, we would head to the farmers' market as a family and my kids would choose a new, healthy food to try. Like a scavenger hunt, my new food adventurers would race from stall to stall, scouting out our new food of the week. This kept us focused on local, seasonal produce. Then the kids would prepare the recipes. "Five ingredients or less and easy enough for a five-year old to make!" was our mantra. Cooking together as a family, we learned to make easy, healthy recipes that the whole family would enjoy. We chronicled the entire journey on the Crunch a Color website and Jamie Oliver's Food Revolution, making it simple to stay on track. Put the kids in charge. Focus on local, seasonal foods. Cook together as a family. Some recipes flopped and some were voted onto our best healthy recipes list, but each one brought us together to explore, cook, and enjoy new foods as a family. Fifty-two weeks later, I am proud to say that we achieved our goal, but the journey was infinitely more important than the destination. 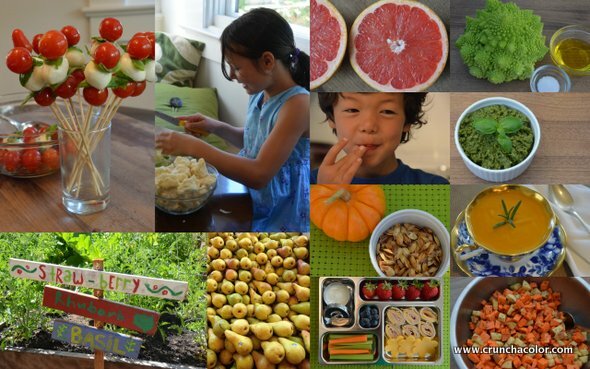 Our 52 New Foods adventure challenged everyone in the family to try something new each week, it encouraged us to start a garden, it brought us together to cook and enjoy healthy food as a family, and it connected us with fellow food lovers in our community. We learned about where our food comes from, the artisans who work tirelessly to grow it, and how the food choices we make impact our neighborhood and the bigger world around us. We gathered treasured recipes and tips from local farmers', chefs, friends and family and together we planted, picked, cooked and tasted our way through the year. Most importantly, 52 New Foods planted the seeds of change at our family table. In 2013, we're taking our 52 New Foods adventure on a tour around the world with Jamie Oliver's Food Revolution. Like the sun, we begin our journey in the East, sampling and savoring foods from Asia. What better way to get ready for the Lunar New Year than to simmer up a fresh batch of warm, Asian pear sauce! Ready to have fun eating healthy with us in 2013? Start by choosing one new healthy food to try this week. It's the easy way to healthy. Tune into Crunch a Color's 52 New Foods adventure on Twitter, Facebook and Crunch a Color's weekly recipe blog. Simply follow @crunchacolor and #52NewFoods. This deliciously simple broiled grapefruit recipe adds a flavorful twist to your family table: a sweet and juicy treat without a drop of refined sugar. Kumquat jam adds a simple citrus touch to savory dishes: a burst of sunshine to start the New Year! Pomegranate seeds are delicious, but they can be messy. Here's a quick tip for how to seed a pomegranate the easy and fun way, with no mess! For more easy recipes and new, healthy food inspiration, check out Crunch a Color's roundup of the best healthy recipes of 2012! About the author: Jennifer Tyler Lee is a mom of two children and the creator of Crunch a Color® -- the award-winning nutrition games that make healthy eating fun. Like most parents, she struggled to get her kids to eat healthy, balanced meals, so she decided to make it into a healthy eating game and she's giving back to support non-profit kids' nutrition programs. Winner of the Dr. Toy and Parent Tested, Parent Approved awards, Crunch a Color® has been featured by Jamie Oliver's Food Revolution, Laurie David's Family Dinner, Kiwi Magazine, Dr. Greene, and Yum Food & Fun For Kids, among many others, as a simple, fun and playful way to get kids to eat healthy and try new foods. Jennifer's passion is making mealtime fun, easy and healthy for busy families. Her easy recipes, quick tips, and new food adventures are regularly featured at Pottery Barn Kids, Jamie Oliver's Food Revolution, The Huffington Post, and on her weekly recipe blog at crunchacolor.com.